I posted a chart, last week, showing the spectacular reduction in measles cases and measles deaths following the introduction of measles vaccination in the mid-1960s. Anti-vaccine loons often dismiss such charts by claiming that they only demonstrate the effect of sanitation, or something — as if sanitation was only introduced into the US in 1965. 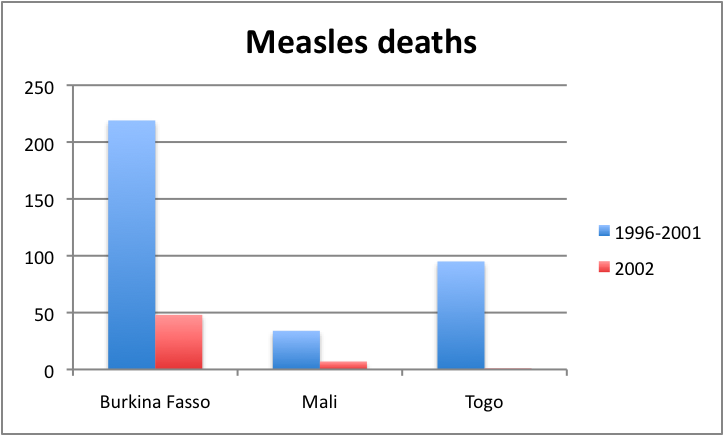 In any case, here are some more data, showing the effect of measles vaccination at very different times, in very different countries. 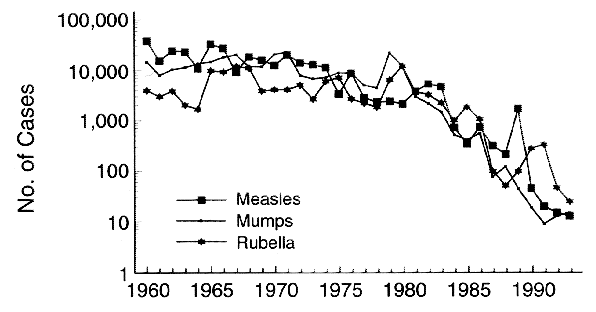 Finland had a problem with measles, as well as mumps and rubella, in the 1970s. The vaccine coverage was about 70%.1 It’s important to note that for measles, which is probably the most contagious disease known to man, very high vaccine coverage (probably over 90%) is necessary to protect against outbreaks — this has been shown by modeling as well as by experience. Here’s the chart showing measles incidence in Finland. Note that this is a log scale, not a linear scale, on the Y axis. Also pay attention to the dates: Remember, 1982 national vaccination — 1986, final push. 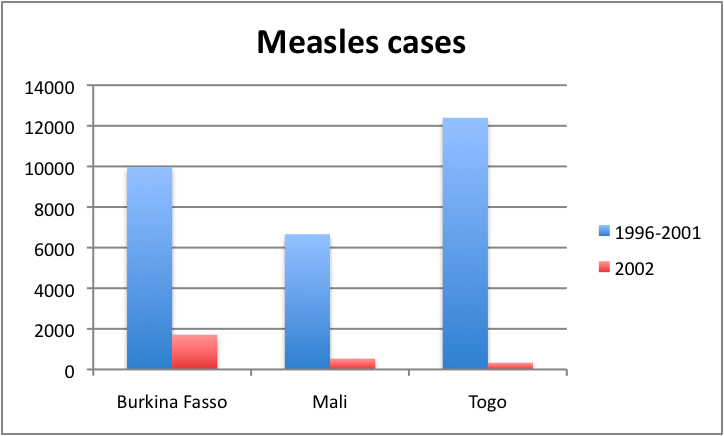 It would be hard to find more different circumstances than between Finland and Burkina Fasso; yet in each case, increasing measles vaccine coverage to the proper level vastly reduced measles cases and deaths. Eh? I thought that was stupdity. Thanks for this post and the last – I think the graphs are the most effective counters to the anti-vaccers that I’ve seen. Craziness! I have started teaching General Biology at an area college and at least once a semester someone tells me they are not vaccinating their child because vaccines are bad and cause autism. The anti-vaccine loons have gotten a lot of popular press lately–and the lay public doesn’t know any better! Great post. There is a mumps outbreak in Southern BC at the moment, which has been tracked to a local religious community that does not vaccinate its kids. Schools go back soon and they are predicting a further jump in cases. Yes, if only the entire graphs were included. Instead the author chooses to leave out the data showing how high measles cases were long before vaccination was introduced. Measles cases had decreased by 95% before vaccination was used. There is an explanation of the type of research fraud the author uses. It’s much like taking a picture and cropping out information until the picture tells the story you want it to tell. Hi, Jon. This is a common lie of the anti-vaccine loons, promulgated mainly (I believe) by the whale to guy. If you look at his graphs and then compare them to the references he claims he took the graphs from, you’ll find that the claims you’re parroting here are flat-out lies. The references he himself cites are not even close to the charts he shows — there is no relationship between the reference numbers and his charts; he simply made up the charts and offered the references as a fig-leaf, knowing that credulous people like you wouldn’t bother checking. In fact the references he cites perfectly support the fact that measles incidence hardly dropped until the vaccine was introduced — certainly nowhere near a 98% drop.